JAKE LEHMANN has said that the opportunity to join Yorkshire was too good to turn down as he prepares to make his debut in the Roses match today. Lehmann – son of former Yorkshire batsman and current Australia coach Darren – has been signed for the final six County Championship matches of the season. Yorkshire moved quickly to snap him up after Travis Head, their overseas player, was called up by Australia on Monday for their tour of Sri Lanka. Fellow Australian batsman Lehmann, 24, arrived in England from Adelaide on Thursday and said he cannot wait to get cracking in a Yorkshire shirt. 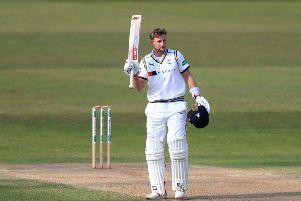 “I didn’t expect this to happen, and to get the opportunity to come over and play county cricket for Yorkshire is something you just can’t turn down,” he said. Lehmann, fresh from helping Australia A to a 2-0 series win at home to South Africa, is looking forward to learning from the Yorkshire squad. It is a squad packed with quality international players, which he feels can only benefit his game. “There are some high-quality players playing for Yorkshire and some that have played Test cricket,” he added. Lehmann, who plays his state cricket for South Australia, has made 11 first-class appearances, which have brought him 780 runs at 41.05. He has hit three centuries and two fifties in his 19 innings, with a top score of 205 against Tasmania at Hobart last November. Lehmann is well-known to Yorkshire first team coach Jason Gillespie, who is also his coach at the Big Bash franchise Adelaide Strikers, for whom Yorkshire leg-spinner Adil Rashid also plays. His father was one of the greatest players in White Rose history, scoring 8,871 runs at an average of 68.76 between 1997 and 2006. Lehmann junior joins a Yorkshire team who go into today’s match on the back of a morale-boosting win over Warwickshire at Headingley last week. Yorkshire’s 48-run victory had the feel of a pivotal result in their season, coming as it did in a hard-fought tussle with one of their main title rivals, and it lifted them up to third in the table. Yorkshire are now just 14 points off first-placed Middlesex with a game in hand, and they have their key new-ball partnership of Ryan Sidebottom and Jack Brooks back from injury, with Sidebottom having missed over three months with an ankle problem. Sidebottom and Brooks shared 10 of the 20 wickets against Warwickshire, and Martyn Moxon, Yorkshire’s director of cricket, said their presence has given everyone a lift. “It’s great to have Siddy and Brooksy back firing again,” said Moxon. “I think that’s a really big bonus for us going into the last few weeks of the season. “They’re two massive players for us and they’ve got a great record, and they led an outstanding performance against Warwickshire with the ball. “It wasn’t a perfect performance - batting-wise, we were a little bit patchy – but ultimately we did enough to win the game,” he said. Moxon believes it was a vital victory given the congested nature of the table. “It was such an important win to keep us in touch – vital really,” he said. “It’s given us a boost and momentum going into the last six games. “Afterwards, everybody knew that it was a massive win, the sort of win that brings everybody in the dressing room together. Having started the season like a house on fire, Lancashire have tailed away in recent times. They are not out of title contention themselves, but they really need to finish the season as strongly as they started it to stand a chance. For Yorkshire, six games stand between them and their dream of a hat-trick of titles. After this match, they play Notts at Scarborough, Hampshire at Southampton, Durham and Somerset at Headingley, and Middlesex at Lord’s. Asked how many wins Yorkshire might need to retain their crown, Moxon said: “It’s difficult to know this year because there haven’t been that many positive results around the country. “All I can say is that we’re going to try and win all six games, and if we can’t win, then we have to make sure we don’t get beat.